If you are looking for a quicker and easier way to pay all your bills in one place then Ireland Bank’s Bill Pay is your answer! Who has time to stop and buy stamps, address envelopes and then run to the post office? With Bill Pay, you set up payments with the click of your mouse and say good bye to messy stacks of paper you once had. It is so easy and effortless you will wonder what you ever did without it! Convenience – Receive and pay your bills electronically all in one place and all from your computer. You can set up payments to businesses and individuals. Security – Protect against check fraud with electronic payments instead of unsecured mail. 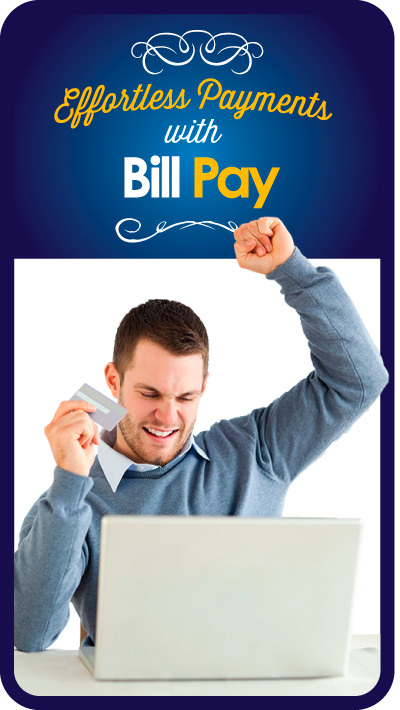 Bill Pay withdraws the payment from your account and delivers it to your payee. Control – Schedule single or recurring payments in just a few steps. Bill Pay gives you the ability to choose when the payment is withdrawn from your account and sent out and you’ll never worry about missing a bill or late fees. Simplicity – Track your payments history at a glance and view all your future scheduled transactions. Savings – Save money every month on stamps and trips to the post office by making payments online. Confidence – Check your account status to securely confirm that payments went through. To activate your Bill Pay account, log in to Online Banking and select Personal Bill Pay under the Transactions menu option. CLICK HERE to see how you can simplify your life with Bill Pay.